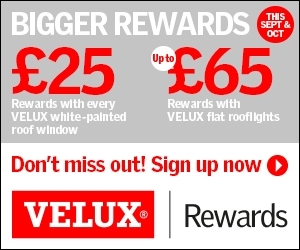 Earn £25 of rewards every time you buy a VELUX white-painted roof window or up to £65 of rewards with VELUX flat rooflights this September and October! Simply log in or sign up at velux.co.uk/rewards and upload your proof of purchase to earn rewards. Just remember to register you purchases before 17th November 2017.